The so-called “Tax Cut and Jobs Act” (TCJA) enacted by Congress last year made massive changes to the federal tax code. Minnesota and other states must now decide if and how to conform their own tax codes to the federal changes. As we note in part 1 of this series, the qualified pass-through income tax deduction in the TCJA is a mess. The state should not touch it with a ten foot pole. However, the state should consider conforming to at least some of the federal corporate tax changes. The TCJA is projected to run up massive federal deficits. 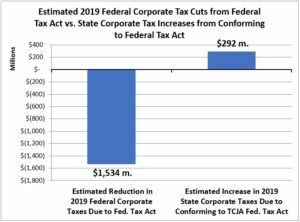 The budget-busting effects of the TCJA are to a significant extent the result of a huge reduction in corporate tax rates, from a high of 35% to a flat 21%. Other TCJA changes actually increase the share of corporate income that is taxable; in the absence of the rate reductions, these changes would have increased federal revenue. Minnesota could generate significant new revenue through conformity to the federal corporate tax changes. In the absence of state corporate tax rate reductions, this expansion of the corporate tax base would increase state revenue. 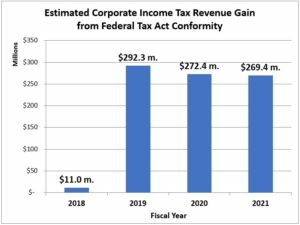 The Minnesota Department of Revenue (MDOR) estimates that conforming to TCJA corporate income tax changes will generate $845 million from fiscal year (FY) 2018 to FY 2021. The state tax increases that Minnesota corporations would pay as a result of TCJA conformity pale in comparison to the massive federal tax reductions they are expected to receive through the TCJA. For example, the estimated 2019 federal tax cuts that Minnesota corporations receive from the TCJA are over five times greater than the estimated state corporate tax increase from conforming to the TCJA. Conformity to at least some of corporate provisions of the TCJA will allow the state to capture a small portion of the windfall federal corporate tax relief for the benefit of all Minnesotans. Some of this revenue is temporary. For example, the TCJA requires repatriation of certain deferred foreign source income. The increased tax liability may be paid over eight years; MDOR estimates that this increased liability would be spread out over this eight year period. In addition, the inclusion of “global intangible low-taxed income” (sometimes known as “GILTI”) in gross income will increase state corporate income tax revenue in the short term. Over half of the increase in estimated state corporate tax revenue from FY 2018 to 2021 is the result of these short-term revenue hikes. The temporary portion of the increased revenue resulting from conformity to TCJA corporate tax provisions should not be used for permanent tax reductions or expenditure increases. Temporary revenues are best used for one-time investments, such as an increase in the state budget reserve to the level recommended by Minnesota Management & Budget. Other prudent uses of this temporary revenue include one-time capital projects—such as investments in clean water infrastructure and rural broadband—or repeal of the requirement for retailers to make accelerated June sales tax payments. The remainder of the revenue generated by conformity to TCJA corporate tax provisions—the portion which is recurring—could be used to direct tax relief to lower- and middle-income households. For example, the 60% of Minnesota households with the lowest incomes are expected to get only 16% of the total tax relief resulting from the TCJA in 2019 and only 3% by 2027. To offset federal tax cuts which favored high-income households, state policymakers could use revenue generated by TCJA corporate tax conformity to pay for increases to Minnesota’s Working Family Credit, modifications to the Homestead Credit Refund and the Renters’ Property Tax Refund, and other changes to the individual income tax that target tax relief to lower- and middle-income Minnesotans who got the short end of the stick from TCJA tax relief. Other responsible uses of recurring revenue generated by conformity to TCJA corporate tax provisions would be to invest in education—a cornerstone of long-term economic prosperity. Despite significant increases in recent years, inflation-adjusted state aid to Minnesota school districts is still well below FY 2003 levels—the year when the state assumed funding of nearly all general education expenses. Real funding for public colleges and universities has also fallen over this period. Investments in affordable health care—including increased access to MinnesotaCare—and affordable housing would also be prudent. Finally, increases in state aid to local governments, which has fallen sharply since 2000, would help to fund municipal and county services, and relieve regressive property taxes. Minnesota corporations received huge tax relief from the TCJA. Conformity to at least some of the TCJA corporate tax provisions would redirect a small portion of this windfall back to the State of Minnesota. The new revenue generated by this conformity could be used to fund critical state investments and provide tax relief to lower- and moderate-income households that—unlike corporations—received little benefit from the TCJA.